It was a tough loss but the Kingswood Oxford varsity boys lacrosse took another step forward on Wednesday. On Saturday, Kingswood Oxford will celebrate its third annual Joe Alissi Spring Sports Day. The Kingswood Oxford varsity softball team picked up its second win of the season on Wednesday with a 12-0 shutout of Pomfret. 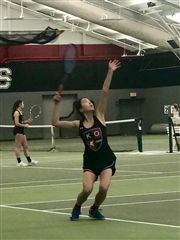 The Kingswood Oxford varsity girls tennis team easily passed its first road test of the season with an 8-1 victory at Ethel Walker on Wednesday. What do you get when you combine a lesson in physics, elements of engineering and add in some twists and turns? Speed! After a short trip to Miss Porter's on a beautiful Wednesday afternoon, the Wyverns lost 3-6 after being unable to hold on to early-match leads across the board. The KO JV Golf Team had a tri-match yesterday at their home course against Choate and Taft. The KO MS A baseball team lost to Foote 8-2. On Wednesday, April 24 the MS girls lacrosse team opened their season with a strong 13-5 win against the Foote School. The MS softball team took advantage of the beautiful weather in Pomfret, beating Rectory School 12-1. The Varsity Boys’ Lacrosse team lost to Hamden Hall on April 24 with a score of 4-11 but showed tremendous effort against a talented team. The Wyverns defeated Ethel Walker 8 - 1 in our first road match of the year. On a sunny, blustery spring afternoon a shorthanded Wyvern squad travelled to Watertown Country Club, to battle the Rhinos of Taft and Kent Lions in the team's first 18 hole match of the year. Small armies of the planet's caretakers took to the gardens, lawns and major thoroughfares in West Hartford around the Kingswood Oxford campus to clean up the area in celebration of Earth Day last Thursday afternoon. Wyverns fall to Hornets at New Haven Country Club. On Saturday, April 20th KO hosted Choate on a rainy day, forcing all of the matches indoors. The Kingswood Oxford varsity boys tennis team is off to a solid start to the season while playing against some top notch competiton. The Kingswood Oxford varsity girls tennis team remained unbeaten with a pair of hard fought wins. The Robert Googins Speakers' Forum is a long-standing KO tradition that showcases sophomores' public speaking skills with an interpretive reading. The team played a great match against the Titans of Wilbraham & Monson. The JV Golf Team at their home course, Tunxis CC, fell to Avon Old Farms. The KO MS A Baseball team beat Hopkins 8-2. Kingswood Oxford Varsity Baseball lost 4-1 to Avon Old Farms on Wednesday afternoon. Girls varsity tennis defeated Choate Rosemary Hall 6 matches to 3 in a very tight well played match. The Wyvern linksters travelled to Wintonbury Hills, home of the Pelicans, for an all-Founders League contest with Loomis, Westminster and Kent. KO middle school softball won a tight match-up against Hamden Hall at home, 14-13. This year's Wyvern Invitational A Cappella Festival (WIAF) featured 180 performers from 11 choirs from nine independent and public schools competing for the top prizes. The KO MS A Baseball team lost to Rumsey Hall 11-3. The Wyverns (1-2-1) suffered their second loss of the season, losing to Kent 6-5 in extra innings on Saturday afternoon at Kent School. On Saturday afternoon, the Boys V Tennis team earned a 7-0 victory to push our record to 2-1. We expected that this game would be a challenge for us, given Cheshire's historically strong roster. That didn't stop the Wyverns from laying out our best effort. KO varsity tennis defeated Pomfret 4-3 in a close well played match. It came down to the final out in the final inning that put us ahead. Niamh Foley led the team in hitting with two homeruns, Sophia Radmanovich and Georgia Louis were defensive standouts. Playing in the top spot in the lineup and getting off to a fast start while she’s at it, Kay Chin '24 is the Wyvern of the Week. Answering a challenge from its coach, the Kingswood Oxford varsity softball team responded with a huge sixth inning to post its first victory of the season. KO students attended the CAIS Student Diversity Leadership Conference. Kingswood Oxford Varsity Baseball (1-1-1) battled Choate Rosemary Hall on Thursday afternoon at Mandell field to a 3-3 tie. Spring season is in full swing for Wyvern athletes! JV Girls Tennis falls to Ethel Walker. The KO MS A baseball team beat Hamden Hall 7-3. In our spring opener, Middle School softball beat Hamden Hall by a score of 10 to 4. Deerfield came to KO for a late afternoon match, and what looked to be a close match turned into a 6-0 victory for Deerfield. The Lady Wyverns took on the aggressive and tough Saints of Canterbury. Girls varsity tennis defeated the Kent School 6-3 in a good Founders League match. The Varsity Golf team opened its season on Wednesday with a match at Fairview Farms against the host Gunnery and Loomis. We had a tough time this game on the defensive side of things, but we know what we have to work on to turn the next game around. Classic Repertory Company (CRC), the New Reps educational outreach program, performed one of William Shakespeare’s most delightful comedies, A Midsummer Night's Dream through the school’s Goodman Banks Series. KO Gils JV Lacrosse traveled to Watertown CT to take on the Rhinos of the Taft school in a well played close game. Mental muscle propels Middle School Mock Trial team into the final four in the state. KO girls varsity tennis defeated Hamden Hall 7-0 in our opening match of the season. JV Girls Lacrosse eaarns first win of the season. JV Girls Tennis drops match to Choate Rosemary Hall. This game had its roller coaster ups and downs, but the Wyverns found their groove to dig deep in the batter's box and finish the game early with a 10 run mercy rule at 18-8 in the sixth inning, after nine straight runs. The Kingswood Oxford varsity boys tennis team will host the 47th Annual Kingswood Oxford Invitational Tennis Tournament (KITT) this weekend starting Saturday. In their first match of the season, the JV Boys tennis team squared off against long-time rival Pomfret. 1st loss for JV lacrosse in over 2 years, over 23 games. The JV Golf Team had their first match this week at Connecticut National against Rectory. The 2019 MS tennis team is young and for many players, the match away at The Rectory School was their first time competing. The Kingswood Oxford Varsity girls’ lacrosse turned things around in the second half after trailing 2-6, but couldn’t get close enough down the stretch, falling to Pomfret. Our first real game of the season demonstrated the Wyverns' progress from the beginning of the season, and left us with clearer goals for our upcoming practices. A panel of five women leaders, representing a cross-section of various careers, spoke to female students and their mothers at the inaugural "Power of Women: Igniting Tomorrow’s Leaders" event on Sunday, March 31 in Alumni Hall. On Tuesday afternoon, the boys V tennis traveled to Hamden Hall in our season opener in cold and windy conditions. 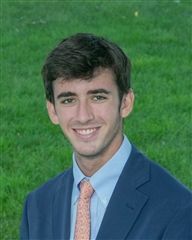 Dr. Dan Gleason has been named the new Head of the Upper School at Kingswood Oxford School. Varsity Baseball got off to a fast start, in their season opener, scoring 13 runs in the second inning at Westmnster. After a successful trip to Florida over Spring Break, the Kingswood Oxford varsity baseball team is ready for the 2019 season. After a successful trip to Florida over Spring Break, the Kingswood Oxford Boys Lacrosse team is ready to start the Brett Garber era. Over spring break, KO’s archivist Brenda Semmelrock took a busman’s holiday to Bath, England to visit part of our school’s roots at Kingswood School. In true pedagogical 'let's continue to raise the bar' nature, English teachers Cathy Scheffelin and Bill Martino were looking for something more for their sophomore honors students. After contending with delays and missing teammates due to the snowstorm, four resolute KO students competed for the first time in the Northeast Regional High School Science Bowl held at the University of Connecticut in Storrs on March 3. Kingswood Oxford held its first Students of Color Summit on March 3. A 25-year veteran Wall Street equity trader, Eric Dobbie, spoke to KO students at a recent Lunch and Lead in the Margaret E. and Henry R. Roberts Center. “Students get a sense of ownership over their own learning when you give them the power to choose,” said Upper School Latin teacher Maureen Lamb. Middle School students apply Newton's Laws in an inventive, hands-on way. 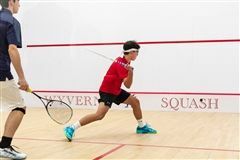 Congratulations to the Boys' Squash team for winning the 2019 NEPSAC Class C Champion spot! Challenging our students to become more autonomous in the classroom, Dr. Jonathan Briggs tasked the students his AP French Language and Culture class to create their own constitution after reading the original French excerpts of Jean-Jacques Rousseau’s earth-quaking work of 1762, The Social Contract. For the first time in its history, the Upper School Legal Wyverns, KO’s competitive mock trial team, advanced to the Final Four in the annual Connecticut High School Mock Trial Competition sponsored by Civics First, Inc.
Sizzle. Shots. Smoky. Stabbings. Sultry. And all that jazz. No one at Kingswood Oxford has seen quite a production on the boards in the Roberts Theater. On Thursday, February 14, students from high schools around Connecticut gathered at the University of Hartford Barney School of Business for a career day hosted by Junior Achievement entitled: An Exploration of Risk Management & Insurance. Last week the entire Middle School participated in a day devoted to diversity and cultural competency. Walking into the Chase Tallwood lobby, your eyes are greeted by a roiling wave that engulfs the aquarium. 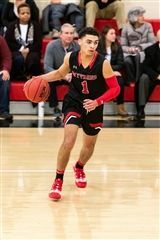 Varsity boys basketball standout guard Sean James ‘19 is the Wyvern of the Week. Forensic Union's public speaking tournament hosted at KO this weekend was an overwhelming success! Whereas some young students get together and relax with video games, the intrepid members of the Middle School Mathcounts math club chilled with some complex equations in order to prepare for the Mathcounts event held on February 2 at the University of Hartford. This was our closest match of the season so far. KO played a great game vs a strong Loomis team on the road. Leading from the start of the game, KO won going away due to solid defense, early transition baskets, and solid half-court offense. The MS Girls A basketball team beat Hamden Hall 52-30. The girls played with heart, drive, and determination. Spirits were high at Westminster’s Hibbard Pool as the Wyverns took on the Martlets in one of the most exciting meets of the season. The match against Berkshire was a close nail-biter, with our players learning how to adjust to a new court environment to pull off competitive individual matches. The Wyvern girls swam some of their best races yet against a strong Westminster team this past Wednesday. For the lucky students at KO, new year’s festivities came twice this year. 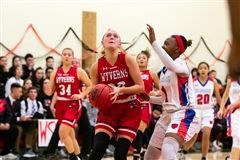 It was a fast paced game for the Lady Wyverns as they took on Hamden Hall Country Day school. The championship match is always a lot for a player's nerves, but our players pulled through the pressure to carry their team to the Division 5 title. In our first real match of the tournament, our players took some time to adjust to the environment and to the strategy of our opponent, but we eventually dug in and found our groove. With matchplay in full swing at this point in the tournament, the Wyverns were ready for their second match from the very start. The B team traveled to Rectory for a rematch. The KO squash team competed in their second match of the week this Saturday morning. The team started off strong going against Greens Farms Academy creating turnovers with their full court press and pushing the ball up the court looking for their open teammates. After a long drive, the Wyverns put up a strong fight against the Dragons and the Wildcats. 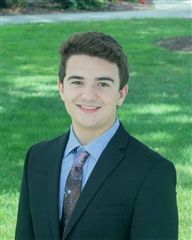 Rohan Naik ’20 will be performing in the Stern Auditorium at Carnegie Hall, one of the world’s most acclaimed venues for classical music in the High School Honors Performance. This evening, the KO middle school squash team traveled to compete against Miss Porter’s School. For Eli Brandt ’23 and Madi Oh ’23, earning gold stars in art class this semester was just the beginning of the recognition they each received for their creative work. 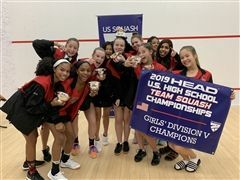 In the midst of a solid season, the Kingswood Oxford varsity girls squash team will look to make its mark at the 2019 HEAD U.S. High School Team Squash Championships starting Friday. Imagine a cross between the motivational speaking style of Tony Robbins and the triple threat chops of actress, dancer and singer Chita Rivera, and you’ll get the sense of the presence of Broadway and film actress Deidre Goodwin. Upon entering Upper School Science teacher Tim Allerton’s classroom last Friday during personal learning block (PLB), you'd spy a transparent filmy hillock of plastic bags on one of the oversized lab tables. With a six point lead at half time, KO went on a 14 point run to open the second half, due to well played defensive pressure. The girls basketball team did a great job working together and making strong passes to one another for open shots. The Ice Wyvern travels to south Kent this past Saturday to take on the Cardinals of the South Kent. KO won the home and away series with Gunnery. The Wyverns had a difficult match against Taft, and many players were playing in new positions on the ladder based on recent challenge matches with their team mates. KO Boys’ swimming traveled to Easthampton, MA on Saturday to compete against Williston-Northampton. The Wyverns went into this match knowing it would be a challenge for them, and despite the final score, they showed their ability to compete diligently despite a difficult match-up. The Wyverns traveled to Williston Northampton on Saturday. The girls put forth great effort in all of their swims. 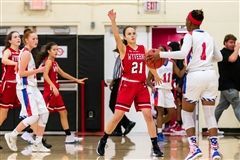 The girls’ basketball team played their hearts out against Westminster on Friday night! After a pair of losses to tough opponents, the Kingswood Oxford varsity girls squash team us back on track and is on another win streak. After an adjudication that took place on November 3, eight Kingswood Oxford musicians moved forward to participate in the Connecticut Music Educators Association (CMEA) Northern Regional Music Festival. The girls found their stride in the second half of the game and played with heart and drive. KO took control in the first half building a ten point lead at the break. Slow start leads to loss for Wyverns. KO drops closest match of the season. The MS Girls A basketball team beat Renbrook 28-12. The Kingswood Oxford girls' basketball team worked hard during the fight against Hotchkiss this afternoon. Wyverns outlast Tigers for the win. 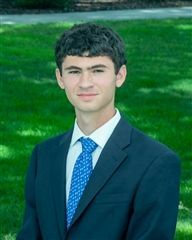 Wyverns Collect Top Prizes at Yale Model U.N.
A delegation of 37 Kingswood Oxford Upper School students headed to Yale on January 17-20 to participate in the highly selective Yale Model United Nations. To hear a firsthand account of one of the last remaining Holocaust survivors is a deeply profound experience. JV Girls Squash fall at Kent. Kingswood Oxford Boys MS A Basketball played host to the Eaglebrook school of Massachusetts. This weekend, nine of our MS squash players competed against Renbrook School. KO Boys swimming traveled to New Milford on Saturday to compete against Canterbury. What an exciting meet! The girls brought their A game on Saturday! The Harvey Cavaliers Traveled to Cromwell CT this past Saturday to take on KO at Champions Skating. Enter. KO got to a slow start vs Westminister down 8-0, however, the team battled back and took control with our three quarter court pressure leading to a nine point half-time lead. 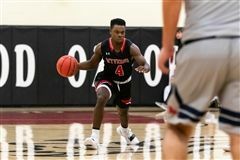 Nick Bray ‘19 had a huge first half, and the Kingswood Oxford varsity boys' basketball team also got a boost to the starting lineup in a convincing 74-55 victory over The Gunnery on Wednesday. The Kingswood Oxford boys' swim team improved to 4-1 on the season with a pair of impressive victories. With the high stakes possibility of scholarship money on the line if they qualify and win in the national contest, the eight finalists in the National Geographic Geo Bee sat at a long table on the stage in the Roberts Theater, steeled with cool certitude of 15th-century Portuguese explorers with a dubious map. Director of Theater Kyle Reynolds announced that actress Deidre Goodwin will be visiting Kingswood Oxford on Monday, January 28th. KO played Gunnery and won 62-29 on the road. JV Girls Squash falls to Choate Rosemary Hall. KO lost to the Foote school 35-26 in overtime. This afternoon, our middle school squash players faced off against the Foote School. Kingswood Oxford Boys Basketball traveled to the Gunnery School for hard fought offensive win. In what we knew would be our toughest match of the regular season, the team kept their spirits up and personal goals in sight despite the skill of our opponents. The Varsity Girls Basketball put in a lot of great effort against the talented Loomis Chaffee team. KO lost a hard fought game at home. JV Girls win game in final seconds. Traveling to Wilbraham & Monson, the KO MS Girls A basketball team won 28-6. KO Boys’ Swimming was back in action last weekend to take on Avon Old Farms at Loomis Chaffee. The Storm of St Lukes traveled to Champions skating center on Saturday for a meeting with the KO Ice Hockey team. JV Girls Squash fall to the Westminster Martlets at home. A sharpshooting guard and senior leader for the Kingswood Oxford varsity boys basketball team, Nick Bray ’19 is the Wyvern of the Week. Seeing her hard work pay off with some early success in the pool, Risha Ranjan ’21 is the Wyvern of the Week. The team knew we would have our most challenging match yet against Westminster, and the individual game scores reflected the immense effort the Wyverns put into this trying match. KO Traveled to Rye Country Day in Rye, New York on Thursday to take on the Wildcats. The Kingswood Oxford varsity ice hockey team overcame a slow start and rolled to a 9-1 victory over Hamden Hall on Ryan Gordon Hockey Night. The team overcame a rough first half to defeat Northfield Mount Hermon in a historically tough matchup. In its first game back from winter break, the KO MS Girls A basketball team beat Rumsey Hall 33-12. The Kingswood Oxford School MS Boys' B Basketball Team lost its first game on Wednesday, January 9th. Kingswood lost a hard fought game against Class A Hotchkiss. The Wyverns won a closely contested meet with NMH on Wednesday 9 January at Trinity College pool. 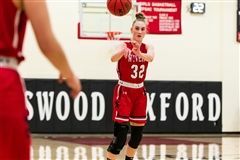 The KO girls basketball team did a great job breaking the aggressive full court press that WMA presented them throughout the whole game but ended up with a loss. The Wyverns battled injuries to step up and secure a victory over the Saints. The KO girls swam against good competition from NMH and earned several victories as well as best time performances. KO hosted the Foreman School Lions this past Wednesday afternoon at Champions Skating Center in Cromwell. Exciting double overtime win as Wyverns stay unbeaten. JV Girls Squash drop opening match of the season. This morning the KO middle school team had the opportunity to participate in a tournament held at Trinity College. V Girls Squash opens the new year with a big Win. KO hosted the Hamden Hall Dragons this past Friday night at The International Skating Center of CT to Celebrate KO’s Ryan Gordon Hockey night. A new year offers us a time to simultaneously reflect and move forward. That’s exactly what our Professional Development Day held on January 2 provided. The Kingswood Oxford varsity boys' basketball team looks to resume its winning ways as the calendar turns to 2019. The Kingswood Oxford boys' ice hockey team will host Kingswood Oxford School Ryan Gordon '05 Hockey Night on Friday night at the International Skating Center in Simsbury.